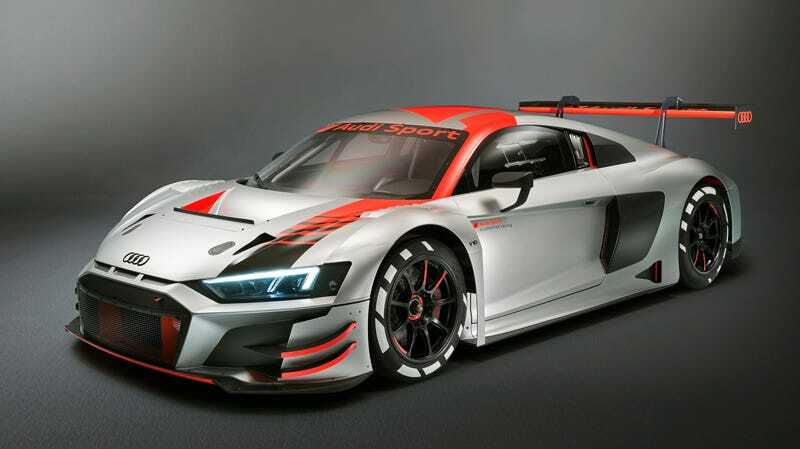 Following the Audi R8 LMS GT3 in 2015 and the Audi R8 LMS GT4 in 2017, the new, 2019 Audi R8 LMS GT3 is the latest of the German automaker’s customer-friendly race cars. They’ve all looked awesome and this one is no different. The new car now has even more optimized aerodynamics and cooling, made extremely clear by the looks of the huge scoops and flares. Audi’s team also made the transmission more durable. It’s an update to the GT3 car from 2015, one that put most of its focus on safety. Not surprising, considering that customers are allowed to drive it. The performance specs for the new R8 LMS GT3 appear to be unchanged, reports Sportscar 365, so it seems like power still comes from the 5.2-liter naturally aspirated V10, good for 585 horsepower. Of course, pros can drive the car, but in the past, amateur drivers have scored victories and titles in America, Asia, Australia, New Zealand and Europe. After its Parisian debut, Audi will deliver its first customer race cars in November and racing starts in January. The cost? €398,000, or approximately $460,000, plus VAT. But if you have the older version of the car and can’t be bothered with buying a new one, then you actually have an option of retrofitting it with an evolution kit. That’ll cost you €28,000, or approximately $32,000. Nobody said racing was cheap. But at least the car looks badass.